Arnone has chosen to include fifteen selections from a larger work by Charles Koechlin (1867 – 1950). Les Chants de Nectaire includes three opus numbers for a total of ninety-six monodies. The fifteen included on this recording are taken from opus 198 and range in length. Each monody is given a provocative title taken from Anatole France’s novel La Revolte des Anges. William Alwyn (1905 – 1985) was a film composer and was on faculty at London’s Royal Academy of Music. 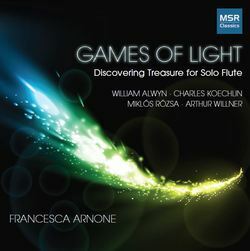 The work included on this recording, his Divertimento for Solo Flute, comprises four movements that are often written on several staves even though they are performable by one player. This type of writing, which requires the player to show differences in dynamics and tone colors, provides a considerable challenge. The Sonata per Flauto Solo, Op. 39 by Miklós Rózsa (1907 – 1995), pays homage to Hungary, this composer’s native country. It incorporates modal melodies and dance rhythms. Rózsa was a film composer and later in life turned to writing for solo instruments. Sonate, Op. 34 by Czech composer Arthur Willner (1881 – 1959) is a highly chromatic, intense work. While many of Willner’s works remain unpublished, this one is available. Occasionally reminiscent of the works of Mahler, this is a work that requires much from the performer. This is a bold recording since it is entirely made up of solo flute works that are largely unknown. Dr. Arnone’s playing is engaging, expressive, convincing, and fearless. She has a beautiful sound and flawless technique. If you are interested in expanding your repertoire, give serious consideration to these works. Learn more about Francesca Arnone at her website, www.francescaarnone.com. This review was originally published in the April 2014 issue of The Flute View magazine. Subscribe here!